One of my earliest childhood recollections is a few days after Christmas, watching my Father, Grandfather and Uncles gathered around a fuzz y black & white image on the family TV. They were all pretty excited about something. Hooting, hollering and clapping. I had never seen such a reaction from anyone watching TV. 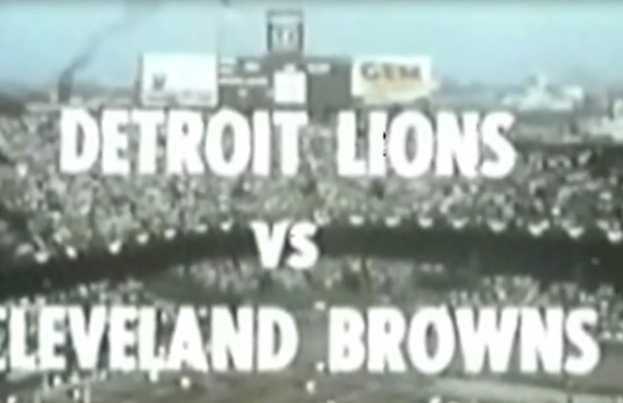 It was the Detroit Lions beating the Cleveland Browns to become NFL Champions in 1957. I remember hearing names like “Van Patrick” and “Tobin Rote”. I sure that I didn’t watch more than a few minutes of the actual game and I am certain that I was a major annoyance to the adults who were so intently watching the picture on that tiny TV screen. This was my introduction to Detroit Sports. I was four years old. I became aware of the Tigers and Red Wings through those same TV images. I remember listening to Tiger Games on the radio. As I grew older, I became a fan too (just like the big guys!). Finally, when I was 6 or 7 years old, My Dad decided that it was time for me to go to my first Tigers game. Money was pretty tight back then so the plan was to buy bleacher seats. Dad decided to ask my Grandfather if he wanted to come along. Grandpa said sure, but on one condition… if I was going to my very first Tigers game, we needed to have box seats… He didn’t have much money either, but this was a high priority to him, so we went to watch the Tigers and Kansas City Athletics at Briggs Stadium and Grandpa bought the tickets. It was a night game and I can vividly recall passing through the walkway and seeing that beautiful green field under the bright lights. The Tigers were right in front of me in their creamy white uniforms with the distinctive old English “D” on their chests. I still remember the smell of the cigar smoke and the hot dogs, the sound of the cracking bat and the adventure of the trough in the men’s room! I think the Tigers won that night… at least that’s what I want to remember. That was the day I became a Tiger fan. From an early age, hockey was always my favorite. I have fond memories of being allowed to stay up late when the Red Wings were on Hockey Night in Canada. Gordie Howe was the man. (Now that I think about it… He still is!). I wanted to be a hockey player when I grew up. I’d pretend that I was Howe or Lindsay or Delvecchio or Sawchuk. I watched every Red Wings game that was televised (at least the ones that my Dad allowed me to stay up for!). Finally in 1964, Dad took my to my first Red Wings game at Olympia Stadium. Man, I was soooo excited! The Red Wings were playing the Chicago Black Hawks. The reaction walking into Olympia was similar to the one I had experienced at Briggs stadium a couple years earlier, but much more intense. We were close! I could hear the players yelling, the puck hitting the boards was loud. Not only was this the first hockey game I had ever seen in person, it was the first hockey game I had ever seen in color! Those blood red uniforms of the Red Wings were breathtaking. Goalie, Terry Sawchuck was hit above the eye by a puck (no facemasks then!) and had to be helped off the ice to tend to the huge gash. The game was held up for quite some time, until Sawchuk came back. The Red Wings won that game 3-1. After the game, Dad took me to the concourse, near the dressing room. He told me that “maybe we’ll see some players”. A moment later, one of the Red Wings appeared. It was none other than Mr. Hockey, Gordie Howe himself. I was in awe to actually be that close to him in person. Imagine my surprise when he spoke to a woman standing next to my Dad. He asked her “Is this the guy?” as he pointed at me. The lady said yes. Gordie then picked me up, put me up on his shoulders and took me into the Dressing room. I was still holding my game program. Gordie took it from me and turned it to the player picture page. He then went around to every player in the room saying “Here, sign this for the kid”. They all did… except Terry Sawchuk who was seated slumped in a chair still wearing his goalie pads. With that huge cut above his eye, I could clearly see all the stitches. It was rather apparent that he wasn’t in a particularly good mood and wasn’t very interested in signing an autograph for a snot-nosed kid. Terry said something like “Forget that book” (or perhaps it was another word that starts with an “F”). Gordie replied (paraphrasing) “Please sign this program for this young fan so I will not be forced to place this program into one of your body cavities” (The actual language was more colorful than I have noted here). Terry signed the program and even shook my hand. Gordie took me back out into the concourse to my Dad, who himself, couldn’t believe what just happened. Turns out that the Lady who arranged my locker room visit was a co-worker of my Dads and was a very good friend of the Howe family. It would not be possible for any kid to experience something like that and not become a life-long fan of the team and this sport. 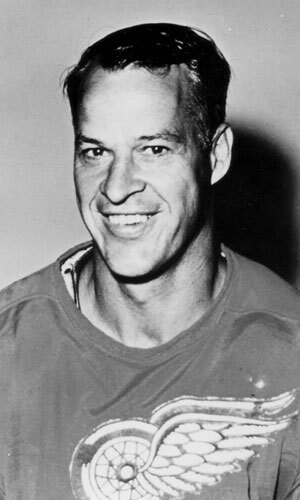 Even today, Gordie Howe is my idol. There was no turning back. I was hooked. The Red Wings, Tigers and Lions were my Dad’s teams. They were my Grandfather’s and my uncle’s teams too. Now, they were my teams. 1968. The year after the Detroit Riots. We had moved out of the city into the Suburbs a couple years earlier. The Tigers had a very good team in 1967, finishing in second place and started out even stronger in 1968. We all followed them closely. 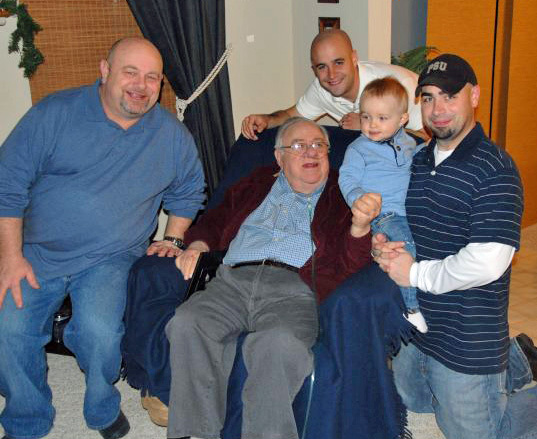 One day in July, we received a call that my Grandfather had suddenly and unexpectedly died. After his funeral, I was at his house with my Dad helping him go through some of his things. Dad opened Grandpa’s wallet and pulled out a Tigers schedule. Grandpa had meticulously wrote the wins and losses on that schedule right up until the day before he died. My Dad said, well, I guess we don’t need to keep this around any more. I asked him if I could have the schedule. He gave it to me and I finished writing the W’s and L’s for the rest of the season. 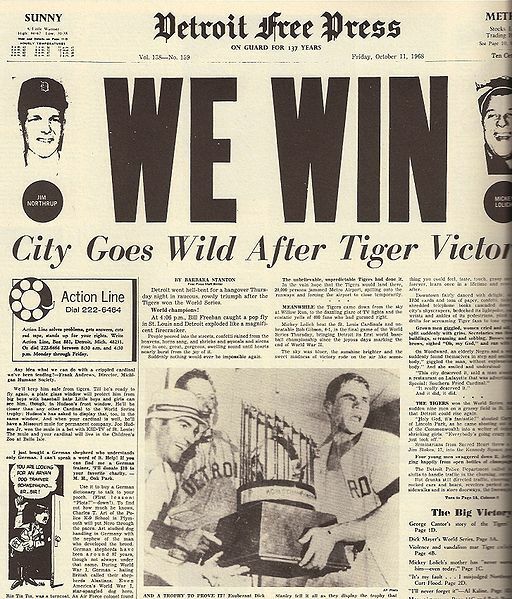 The Tigers went on to play in and win the World Series that year. Grandpa would have loved watching that. The next time that the Tigers would win the World Series was in 1984. I watched the clinching game with my Dad with my own two young sons nearby. I will have to ask John if he remembers that day. He was four years old. My love of the Detroit teams was passed down to my sons. 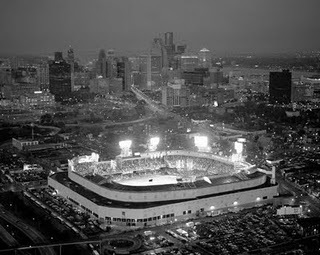 I took each of them to their first games at Tiger Stadium, The Silverdome and Joe Louis Arena. I wonder what kinds of memories they have of those games? Fast forward to 1997. The Red Wings in the Stanley Cup finals. My two boys , who were now hockey players, watched the games with me with keen interest. 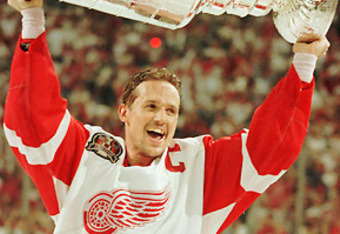 When the Wings clinched the cup I had tears of joy running down my face as Steve Yzerman lifted the Stanley Cup for the first time. My boys just looked at me. I wonder what they were thinking? My youngest son, Joe is currently in the military stationed in Wyoming and still an avid Fan of “our teams”. The oldest son (who now works for the Lions) now has two sons of his own. I am anticipating this cycle to repeat itself again with them. I can’t wait. It’s almost time! Nolan is four years old. The roots are deep. These are our teams throughout the generations. I have brothers and sisters who live in Illinois and California. All of them (as well as their children) are still diehard Detroit fans regardless of where they live. I’m pretty proud of that fact too. Dad & Grandpa have both departed and I miss them both but whenever I see that Old English D, The Winged Wheel or the Leaping Lion, it brings them back. Finally today, the Red Wings, Tigers and yes, the Lions are all good teams at the same time – for the first time in my adult life. Dad & Grandpa would like that.